This PDF 1.6 document has been generated by Adobe InDesign CS5.5_J (7.5.3) / Adobe PDF Library 9.9, and has been sent on pdf-archive.com on 24/12/2015 at 15:39, from IP address 5.18.x.x. The current document download page has been viewed 363 times. 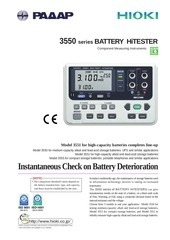 6/30/60/300/600 V (20 k-ohm/V) Accuracy: ±2.5 % f.s. 6/30/150/300/600 V (10k-ohm/V) Accuracy: ±2.5 % f.s. All information correct as of Dec. 27, 2012. All specifications are subject to change without notice. relative importance of cautions and warnings. adjuster to adjust it correctly. case, apply anti-static treatment to inhibit electrostatic charge buildup. the treatment may need to be reapplied periodically. of injury to the user or damage to the equipment. the equipment or to its correct operation. check the following items before using the instrument. 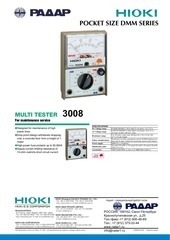 to the specifications, contact your dealer or HIOKI representative. benefits of the various functions. Observe the following precautions to avoid electric shock. or cause an accident resulting in injury or death. an accident resulting in injury or death. 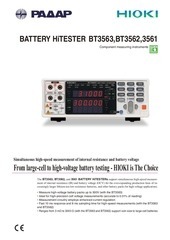 contact your dealer or HIOKI representative. wet and do not use the unit when your hands are wet. gloves, boots and a safety helmet. equipment, be sure to carefully read the following safety notes. others from using the unit inadvertently. excess of the measurement range is input. may no longer satisfy its specifications. After use, be sure to turn the power switch off. accident resulting in injury or death. measuring resistance in a circuit. 1. 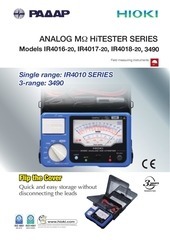 Set the range selector switch to the proper Ω range. reading will be about the center of the range. one to the Positive (+) terminal. adjust the pointer to the 0 Ω scale. reading to zero using the zero ohm adjuster (0 Ω ADJ knob). etc.) to check that the instrument is functioning correctly. ends of the test leads by wiping with alcohol or similar solvent. shown by the factor for the range in use. cause an accident that might result in injury or death. 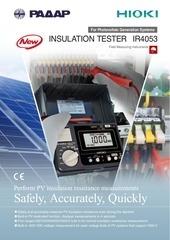 to the range proper for the voltage value. the negative side, then the pointer deflects normally. screws before using the instrument. 2. Set the range switch to the Ω x 100 range, and short the test leads. damaged. Check again after replacing the fuse. down the short circuit with the fuse. with a small amount of water or mild detergent. such as benzine, alcohol, acetone, ether, ketones, thinners, or gasoline. They may cause discoloration or damage. 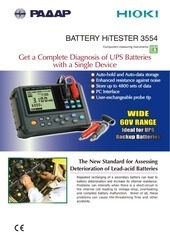 damage from battery leakage could result. 1. Remove the case back screw and take off the case back. 2. Replace the two batteries. the screw before using the unit. 2. Replace the fuse with a new one. NOTE:A spare fuse is provided inside the carrying case. screw before using the unit. Approx. 3.7&quot;W x 5.28&quot;H x 2.2&quot;D, Approx. 12.3 oz. This file has been shared by a user of PDF Archive. Document ID: 00326462.